ersol Thin Film in production now? On the first day of Intersolar 2007, I stopped by the Oerlikon Solar stand and chatted at length with Juerg Steinmann from Marketing Communications. At Intersolar this year, Oerlikon Solar promoted Turnkey solar factories from just one supplier with the introduction of the TCO 1200 as the final element of their turnkey thin film solar module manufacturing solution, FAB 1200. The TCO 1200 deposits a Transparent Conductive Oxide on glass for front and back electrical contacts via an LPCVD (Low Pressure Chemical Vapor Deposition) process using Zinc oxide. As Mr. Steinmann pointed out, there are different flavors of Oerlikon Solar’s turnkey solutions dubbed standard/standard+ (plus), turnkey/turnkey+, and tandem depending on production line equipment selections such as the TCO 1200. Mr. Steinmann tackled my perceptions about Oerlikon’s fixed module size of 1.1m (meters) by 1.3m having limited use in BIPV (Building Integrated PhotoVoltaics) applications. Mr. Steinmann said this module form factor was selected as the optimal size to minimize cost, maximize efficiency, and address practical issues. First and foremost, this module form factor is designed to provide the lowest cost per Watt-peak and deliver competitive kiloWatt-hours (kWh) because of a smaller temperature coefficient than multicystalline Silicon (mc-Si) solar modules. Also, in cloud induced shading, the smaller form factor helps to maximize array output versus larger modules. Practical considerations include the cost to replace a broken module and module handling. The module size enables a single person to carry and install the module even in countries with strict union or workplace rules about lifting. For large scale solar power plants, this Model T product strategy has been proven a winner by First Solar, and I believe Oerlikon’s customers can be successful in this application. However, I remain skeptical whether these modules will succeed in BIPV applications. On the technology and bookings front, Oerlikon hosted a Solar Day (including presentations) on June 15, 2007, in cooperation with manufacturing partner, ersol Thin Film GmbH. ersol Thin Film is the first Oerlikon customer on the cusp of volume thin film module production. A few statements by Dr. Uwe Krüger, Chief Executive Officer of OC Oerlikon, from the Solar Day event ring true versus Oerlikon’s competition in solar thin film manufacturing solutions. Our customers – and this is very important to us – confirm that we have a 12- to 18-month lead. Whereas our competitors announce a lot of new developments, but so far cannot demonstrate any real production lines, the ersol fab is a reality. We don’t just promise – we deliver. Our production line turns out 120 square meters of silicon thin film solar modules per hour at a power of 70 Watt per square meter. These are real values, and not just numbers on a PowerPoint slide. This Solar Day event is covered in Solar Newsletter No. 1 June 2007. Oerlikon Solar just began publishing this monthly newsletter called “solar at work” in English and German (Deutsch). I suggest going to Register for Newsletter or Download Newsletter to subscribe or get your copy. For my questions regarding ersol Thin Film’s production status, Mr. Steinmann directed me to the ersol stand and Karsten Weltzien, one of ersol Thin Film’s managing directors. A last question about the status of API GmbH orders was shrugged off with no news to announce as expected. Later at the ersol stand, Mr. Weltzien recognized me as I arrived. I first met Mr. Weltzien last year at Intersolar 2006. Mr. Weltzien confirmed ersol Thin Film’s production is sold out to a small number of key partners but could not provide any color on the official volume production start date besides production this summer. As far as production targets and capacity, Mr. Weltzien reiterated news from the recent ersol Annual General Meeting. 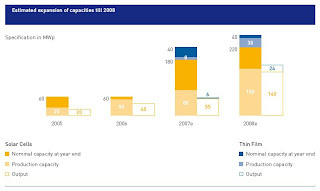 ersol expects to have 40MWp (MegaWatt-peak) of thin film solar module capacity in place by the end of 2007 and estimated production of 6MWp of thin film modules in 2007 and about 24MWp in 2008. ersol has also disclosed plans to increase thin film module production capacity to 100MWp by about 2010. Per Mr. Weltzien, ersol Thin Film Fab 1 production of amorphous silicon (a-Si) thin film Nova® solar modules will be binned to 75Wp (Watt-peak), 80Wp, 85Wp, and 90Wp ranging from 5.25% to 6.29% in module efficiency centered at 80Wp. I trust I got these peak power bins correct since I was unable to confirm these with ersol before posting. ersol has mentioned 120Wp as a longer term target; I expect a Micromorph Tandem thin film module will be needed to achieve this goal. Serial production planned to begin at the start of August 2007. Reading between the lines and weighing the facts, I believe ersol Thin Film can be considered in production now. I expect thin film solar modules produced until the official production announcement in August and passing all production tests and meeting quality and warranty requirements will be shipped as finished product. Please don’t read anything into my disclosure below; this is my independent assessment and intuitive assertion. After I wrote Applied Materials Solar shuts out Oerlikon Solar 3:0, I was surprised by the level of interest this post generated although I knew there was a dearth of coverage concerning photovoltaic production equipment. As alluded to in Oerlikon Solar: Company Dramas upstage Thin Film progress, this is in fact the future post regarding positive developments at Oerlikon Solar, a division of OC Oerlikon Corporation AG (VTX:OERL). And The OC of OC Oerlikon stands for “one company” not Orange County or Ocean City. Oerlikon is a suburb of Zürich where the company was founded back in 1906. I first noticed this connection mapping hotels in Zürich.